The Dawg House Diner in Dwight Illinois on Route 66 is part of a collection of HDR photography included in our Road Trip 2011 Calendar now available for sale, just in time for and making nice holiday gifts. Every picture tells a story and this one is no different. After the first 8000 miles of our 17,000 mile journey, I came to realize that when Darlene photographs her subject, any sort of thing can happen. From the Texas neighborhood watch that approached us within 2 minutes of arriving at the ward lefrance pumper, to a skateboarder taking his goldfish out for a ride, coasting through our shot while the shutter was open. After a few days in Chicago visiting historical Al Capone sites including his grave site, touring the filming locations of the Blues Brothers and some geocaching, we decided to spend a day on Route 66 in Illinois. It was on our last day in Chicago when waiting to cross the street to the Museum of Art, we noticed the Route 66 mile zero marker on it’s post on the side of the street. We had been to a few parts of Route 66 while in Arizona a few months earlier and thought “We simply have to see Illinois’ section while so close”. We started out early and made our way from the Leisure Lake RV Resort near Joliet Illinois, through Joliet and south west to Dwight. Dwight has an enormous amount of history aside from it’s involvement in Route 66. Downtown Dwight boasts the First National Bank building designed by Frank Lloyd Wright in 1905 and the Keeler Institute (now the Fox Development Center) which includes some amazing stained glass windows. I mean really amazing. 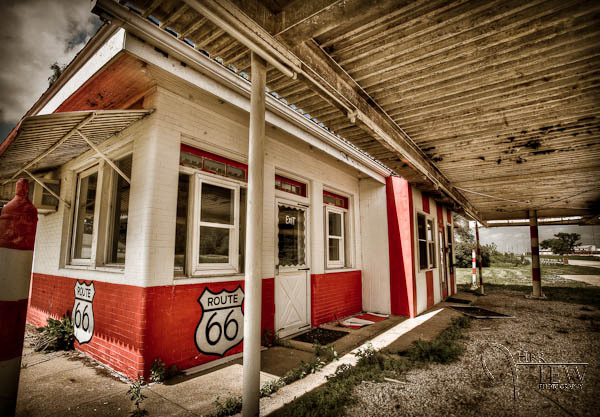 It’s also home of one of the oldest operating gas stations along Route 66, the Amblers Texaco gas station. It’s been restored to very near it’s original condition and serves as a welcome center for Dwight. we bought and mailed some postcards from here. We learned earlier from one of our RV magazines that it was national Pick Some Litter day and that RV’ers were encouraged to clean up any liter they found today. We cleaned up around the diner a little before setting up the tripod. It was a bit tricky to get a good angle because of an obstacle in our way (see video), but Dar did her best. Using a wide angle lens includes objects very near the camera, so like I said, it was a bit tricky. Have a look at the rest of the HDR Photography included in the Road Trip 2011 Calendar and then go ahead and order as many as you’d like using the buttons on the bottom of the page. Stunning imagery of places such as Rhyolite Ghost Town near Death Valley in Nevada, the Tombstone Boot Hill Hearse, a couple of shots of a classic fire truck from Corpus Christi Texas, two more all American diners from Rochester New York and Bisbee Arizona, a vintage corvette on a beach and more from Route 66. Hello, I’m with the Dwight Main St Program and am interested in viewing more of the photos that you may have taken on your Route 66 drive thru our town. I have ordered the calendar(LOVE IT!) . We are looking for fund raising opportunities and I thought some of your photos might be available. Please contact me with your thoughts. Thank you. It has always been my dream to road trip through the USA. My girlfriend did when se was young. Hopefully she can come back and bring me along. Great blog posting. congrats need to know what tools and special equipment, besides a standard tool box, we should take for motoring to various States in April-May to see family/friends. Thank you. You need to make sure you have a way to measure tire pressure on all your tires, even the inside ones if you have duals like we do. Get a good one. Make sure you have a level for inside when you’re setting up to get the floor even. After that it really depends on what sort of RV you have. Check with a good RV supply place like Camping World or something like that. If your unit doesn’t already have supplies make sure you have the pieces to connect your sewer line even if the connection is far away. We had to buy extra hose. We also had to buy a device to put it up off the ground for one RV park that required that. Love your site – my husband and I are hoping to do something similar in about 5 years when we retire. Are there any other blogs or sites you recommend for first time RV adventurers??? Too bad the legendary Route 66 has has disappeared. One can only find parts or traces of it here and there. One of my biggest dreams is to travel across the USA on Route 66 by car. Hope one day I’ll accomplish my dream!